CCB is a leading installer to the Craft Brewing Industry and water processing industry in Maine. As a general contractor with over 70 years of experience, we bring a holistic view to all we do. 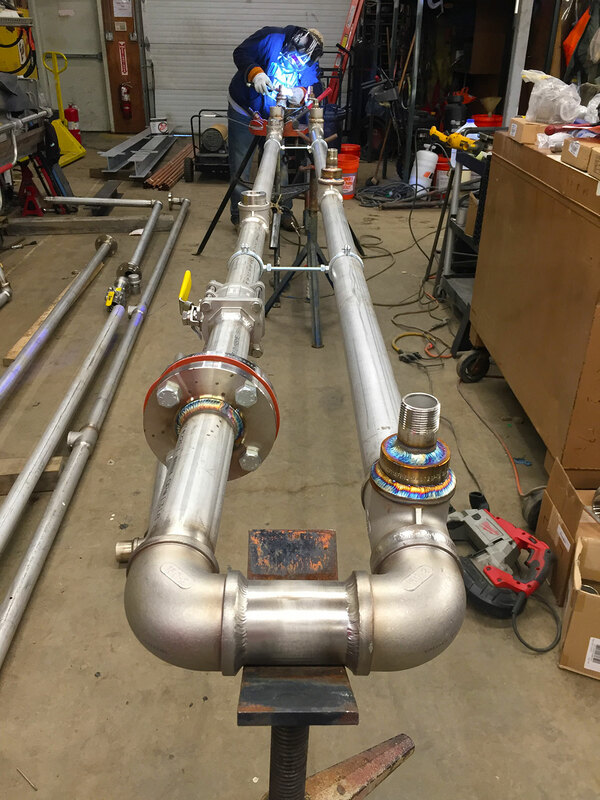 CCB can engineer, fabricate, deliver and install high quality process piping, and install custom stainless-steel fabrication. We have installed complete bottling lines, and provided general contracting services to many Northern New England firms in this arena. CCB provides mechanical and general construction services including brewhouse installation, fermentation tank installation, filtration piping, process skids, valve manifolds and CIP systems. We can provide complete turnkey systems and custom design / build services to your firm with the technical support and resources available to make your brewing project a success. We work closely with our clients to support their engineering efforts and to deliver projects that exceed expectations. Once commissioned, our field installation crews assure correct system calibration and verification. CCB welders are certified to the ASME BPE, ASME Section IX and B31.3 Process Piping Code. Our matrix piping methodology is based on hard piped systems that are fully drainable. CCB offers a wide range of services that are specific to high purity liquid processing. We specialize in modular construction and field piping installation. At CCB we champion the use of fixed stainless-steel pipework wherever possible. If necessary we use hygienic brewery hose with stainless steel fittings. We employ welders and pipe fitters who are experienced and skilled in producing high quality hygienic purge welds. Our team includes fully licensed master plumbers, who are experienced and licensed in Natural Gas, LP, Solid Fuels and Oil. Since CCB’s inception, the firm has successfully supported industrial, institutional and commercial clients with a full range of industrial and mechanical services including design, fabrication, construction, installation and maintenance of piping systems, pressure vessels, and platforms, as well as equipment installation, rigging and millwright services. Pressure Vessel (PP&R Stamp services) and S stamp (Power piping) services.